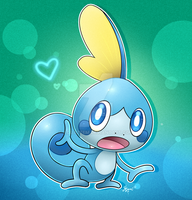 Some Sugimori-style fan art of Sobble, the latest Water starter from Pokémon Sword/Shield. Working on the other two starters now, should hopefully have them done by the end of the day. Edit: Fixed the outline on the chest. Good morning friend, Sobble's poses are good!!!. OK why does this Pokémon remind me of Randall from monsters Inc.
because both of them look like lizards? Gee, that was quick! Quite nice! Sobble is who I am picking as my starter. Sorry for the extended absence. It's been four and a half years! Long time no see anything from you, Xous54! I missed your art so much! I'm finalizing the pose for Scorbunny's art right now, should be up in a few hours. Love the the way you draw outlines!